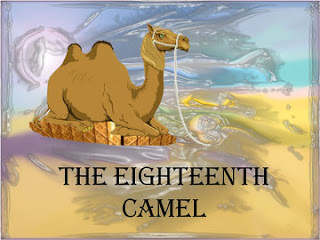 Story: The 18th Camel - Something New Everyday! There was a father who left seventeen camels as an asset for his three dependents. When the father passed away, his family opened up the Will. of the total number of camels while his daughter should be given 1/3rd (one-third) and his widow should be given 1/9th (one-ninth) of the total number of camels. three or seventeen by nine, the three started to fight with each other. camels. That increased the total to eighteen camels. Now, he started reading the deceased father's Will. the wise man took back! 18th camel i.e. the common ground. Once a person is able to find this 18th camel, the issue is resolved. solution, we won't be able to reach an amicable conclusion!